Steve Kinniburgh knows Corby Town must target a six-point haul from two more away games over the next week. But for that to happen, the Steelmen boss is keen to see his team cut out the “individual errors” after their thrilling 4-4 draw at Sutton Coldfield Town last weekend. 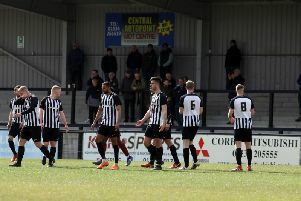 Corby trailed 2-0, 3-1 and 4-2 before eventually earning a share of the spoils thanks to Elliot Sandy’s dramatic stoppage-time equaliser, which was the striker’s 20th goal in all competitions this season. It means the Steelmen go into this weekend’s clash at Aylesbury trailing Evo-Stik League South Division One Central leaders Peterborough Sports by five points. Aylesbury currently sit just above the relegation zone while that trip to followed by a re-arranged clash at Welwyn Garden City next Tuesday. And Kinniburgh wants to see his team getting back to winning ways. “We picked up a point from a losing position last Saturday and in some aspects it can be seen as a point gained but in other aspects it can be seen as two points dropped,” he said. “With the situation we are in where we are chasing the leaders, we simply have to put as many points on the board as possible. “It brings us into two more away games and they are important to us because they are matches that we need to be going out and winning. “We have got to be on the front foot and learn from the mistakes of last weekend. “The goals we lost on Saturday came from individual errors, which is frustrating. We didn’t do some things properly like we had done in the four or five games before it. “We have shown that when we have that defensive shape then we are a difficult side to break down. Kinniburgh, meanwhile, is hopeful midfielder Joel Carta could return following a severe dead leg tomorrow (Saturday) while the Steelmen will also be monitoring the fitness of right-back Miles Smith who has been sidelined with a thigh strain. “We will be looking at both of them this week,” the Corby manager added. “I am hopeful that we could get Joel involved on Saturday but we will just have to see with Miles. “He tried last Thursday but didn’t get through the session so we will look at him again.